It is Saturday morning of the first weekend after the first days of school. It’s not that I was living for the weekend because I don’t like my work. It is that one week ago, I was racked by a psychological disorder, common to most educators, called First Day Jitters. Thinking about my classes, I could only picture blank, emotionless avatars of 7th graders. I was over-planned, but then lacked confidence about my choices for hitting just the right tone for the first days: a balance between fun and structure, opportunities for free-choice and laid-out requirements. One day back in the saddle, though, and I again quoted my old friend, Susan Williams, a Southern woman, who says, “They’re all just a bunch of nice little ol’ kids.” That’s all they come down to, though honestly, our students here do seem to be even nicer than average. I found my muscle memory quickly returning, guiding me on how to engage them and move them forward. And the first Saturday, I am enjoying knowing that I’ve kind of got it down. I have a good picture of where I’m headed, at least, and I can relish a little of the day and this gorgeous time of year. The weather is still a bit hot and we’re eating light, snacking on lots of fruit. 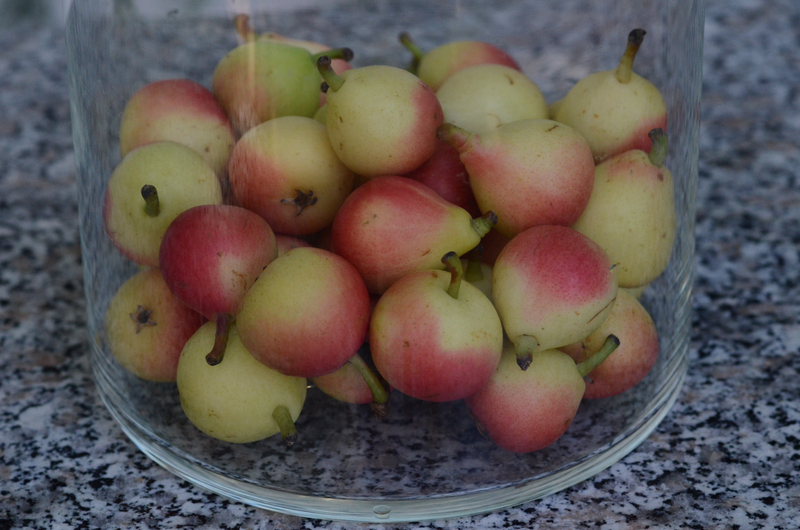 I just noticed these teeny Japanese pears in the market this year. They are only about an inch in diameter and have a remarkably long life. We’ve had a bowl of them available all the time for a few weeks. They are nothing but juice and only a few bites per pear, so they are refreshing without being time consuming or filling to eat. Living in a truly seasonal and local food system brings me so much happiness. It is a delight to discover gems of the produce world at a certain time of year, knowing they will only be available for a few weeks. You can go ahead and make yourself sick on them because you won’t see them again for a year and by then, they will be novel again. It keeps my mental and physical taste buds interested and excited for the next turn. It is feeling like we have only a couple more weeks of fringe summer living. I say fringe because we do have to keep a schedule now, but when we get home, we can still cook and eat lightly. We’ve got beach outings lined up for the next two weekends and while I’m chaise lounging, my mind will be starting to plot buying a hunk of pumpkin to make a soup or roasting beetroot. It won’t be long until we have a complete set change at the market and we’ll be into an entirely new palette of foods. This was a sneak peek recipe from the latest cookbook of the now famous Tartine bakery in San Francisco, Chad Robertson being the celebrity chef du jour. The recipe for his naturally leavened simple country bread, in his book Tartine Bread, is famously 38 pages long. There are blog sites committed to the at-home discipline of attempting to recreate this loaf. His new cookbook will be published in November, by Chronicle Books. The title will be simply Tartine Book No. 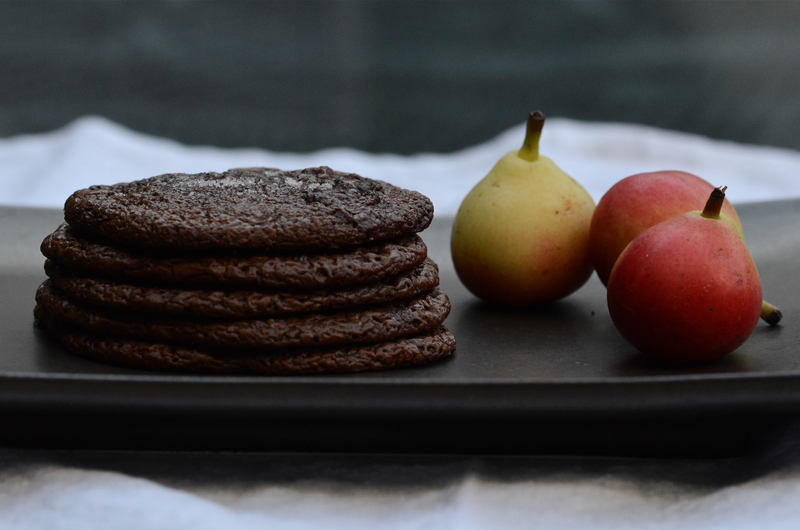 3, and I didn’t find anything too complicated about making these chewy, salty drops that went divinely with pears. In a heatproof bowl set over simmering water, melt together the chocolate and butter, stirring occasionally. Once melted, remove from the heat and let cool slightly. Place the eggs in the bowl of a stand mixer fitted with the whip attachment. Beat on medium-high speed, adding the sugar a little bit at a time, until all the sugar is incorporated. Turn the mixer to high and whip until the eggs have nearly tripled in volume, about 6 minutes. Reduce the mixer speed to low and add the melted chocolate and butter mixture and the vanilla extract. Mix to combine, scraping down the sides of the bowl as needed, then mix in the flour mixture. At this point, the dough will be very soft and loose, which is normal; it will firm up as it chills. Chill the dough in the mixing bowl in the refrigerator until it is just firm to the touch, about 30 minutes (the longer you chill the dough, the harder it is to scoop; if it chills for more than an hour, remove the dough from the fridge to warm up to room temperature before scooping). Preheat the oven to 350 degrees F and line two baking sheets with parchment paper. Remove the dough from the fridge and scoop with a rounded tablespoon onto the pans, spacing the balls of dough 2 inches apart. Top each mound of dough with a few flakes of salt, pressing gently so it adheres. Bake for 8 to 10 minutes, until the cookies have completely puffed up and have a smooth bottom and rounded top. Remove the pans from the oven and let cool slightly (the cookies may flatten a bit when cooling), then transfer to a wire rack and let cool completely. Store the cookies in an airtight container for up to 3 days. 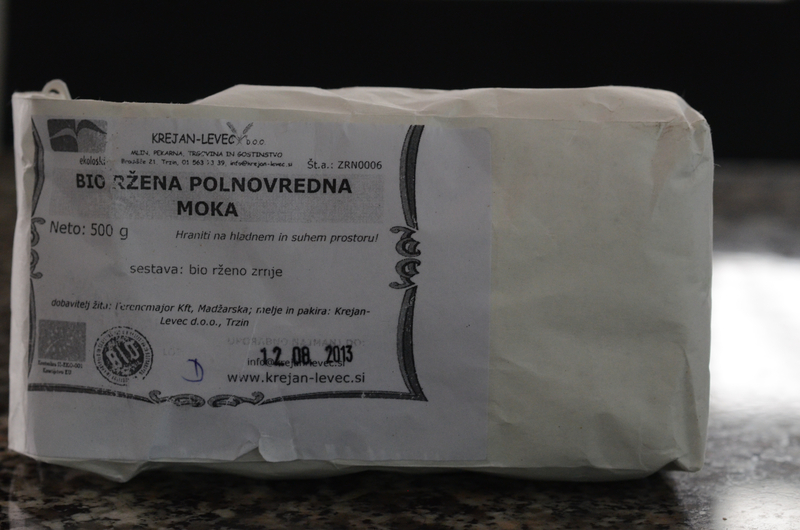 Organic rye flour I bought in Ljubljana, Slovenia last spring. Fantastic little pears! Love their sweet taste, glad you have discovered them. Your picture is perfect and your writing so engaging. A couple of ideas in this post really resonated with me. Striving for “a balance between fun and structure, opportunities for free-choice and laid-out requirements”. Those first couple of days feeling like I’ve nailed it, only to have the honeymoon end and a new adjustment period set in. Ah, teaching.